C Products LLC, a popular manufacturer of M-16 and AR-15 magazines, can “block” their stainless steel body magazines to limit the round capacity. After a fairly lengthy wait I finally recieved a shipment of these magazines. These are 30 round stainless steel magazine bodies that have a tab punched into each side of the body. The purpose of the tab is to restrict the movement of the follower so that no more than 10 rounds may be inserted. 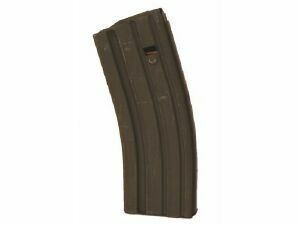 Now personally I would not want to use one of these magazines in my rifles because I do a lot of bench shooting and I think all that extra magazine body would just get in the way. However a lot of people are interested in these type of magazines for the “cool” factor. There also has been some discussion that the level of permanence of the modification could be a “gray area” if it is possible to modify these magazines to allow then to hold more than 10 rounds. I actually think it would be very difficult to do so, as it would probably require the use of a power drill to drill out the tab. If it requires the use of a power tool and the removal of metal from the body of the magazine is that not a “permanent” modification? Just what is permanent?